Audio Numerology Lecture; The Personal Year number. 21 Minutes. Audio Numerology Lecture; The Personal Month and Personal Day cycles. 3 Minutes. Numerology is based on decoding patterns and this is particularly when we deal with cycles. To find your Personal Year number for any given year, add the month and the day of your birth, plus the Universal Year number for that year. For example, someone born on May 15 finds his or her Personal Year number for 2003 by adding 5 (May) plus 6 (the fifteenth day) plus 5 (2003) to arrive at a Personal Year number of 16, which is reduced to 7. Do NOT include your year of birth - there are some websites that tell you to add your month, day, and year of birth to the current calendar year. This is incorrect! The top row of the wave reveals the person’s age. Just as we evolve through a nine-year cycle, so, too, do we experience nine-month and nine-day cycles, even though their impact is subtle compared to the Personal Year cycle. The Personal Month and Personal Day cycles proceed according to the same pattern - 1 through 9 - that the Personal Year cycle does. The numbers within the monthly and daily cycles have a similar, though less pronounced, impact on us than the yearly cycle has. 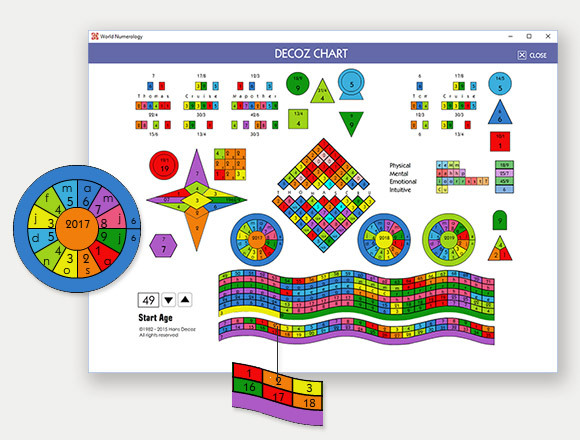 Hans Decoz' Daily Number Forecast on our home page is based on the Personal Year, Month, and Day cycles. We can think of the yearly, monthly, and daily cycles as spirals within spirals, all interconnected. In any case, the patterns are essentially the same. They widen and encompass greater sweeps of time - daily, monthly, and yearly patterns - thus becoming more profound and powerful as they grow. How to Find Your Personal Month and Personal Day numbers. To find your Personal Month, add the single-digit value of the month to your Personal Year number. For example, someone with a 5 Personal Year who wants to know his Personal Month for July should add the 5 (for the Personal Year cycle) to the 7 (for July) and arrive at 12, which is reduced to 3. July is a 3 Personal Month for someone in the 5 Personal Year. Your Personal Year number is a strong indication of the trends and circumstances you will experience during the year ahead. Your Personal Year cycles are based on the Universal Year cycles and therefore run concurrent with the calendar year. Transit and Essence cycles are based on the letters of your name and run from birth date to birth date. There are nine personal year numbers, which makes up a complete Epicycle. Each Epicycle reveals the progression or evolution of a specific part of your growth. Your progress along this Epicycle can be seen very logically, from the infancy or beginning of a growth period in your life, to the conclusion or culmination of that process. The 1 personal year indicates your first steps in a new direction. The years that follow indicate your progress along this path, concluding with your 9 Personal Year, which completes the cycle. The Personal Years form the building steps that mark your progress through life.